I created a new file locally under the Dropbox folder. It was automatically encrypted. This is normal behavior. 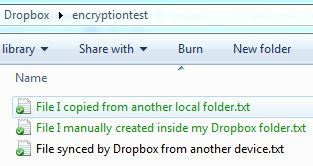 I copied an existing local file from another folder into the Dropbox folder, it was also automatically encrypted. Again, this is normal behavior. I created a file on another machine, and let Dropbox sync it to my Windows 7 PC. The synced file was not encrypted. This is not what I expected to happen – I expected it to be encrypted like in tests 1 and 2. It is recommended that you exit Dropbox during this process to free any file locks it may have (don’t forget to start it back up afterwards). This is my first experience with the cipher command, but it appears to work. It would be nice to be able to stop and start Dropbox from the command line as well, but I haven’t found a good way to do it yet. I contacted Dropbox support, and they recommended that I just use volume-based encryption (like TrueCrypt) and avoid Windows encryption altogether.